Food & hygiene should go hand in hand and here at MAS Environmental we offer the best ways to get this message across. Food poisoning is not only often unpleasent to the individual, but can be fatal. It is a very serious issue to companies too. Food poisoning costs vast amounts of money from lost employment and stock, and worse can destroy a company's reputation overnight. Food poisoning is caused by unwanted matter in food which affects the human body's function, introduced into the food at a stage between creation of the food and consumption (e.g. between the Butcher Shop and the belly). Most common is from Food-poisoning bacteria multiplying on the food into a lethal number until the food is eaten. To prevent this happening each stage in food preparation must be carefully managed so that food is kept safe. Other causes can be harmful chemicals in food (e.g. bleach), solid matter (e.g. fingernails, parts of machinery), poisonous life (e.g. fungi, plants). If all your staff are not aware of these basic common sense causes of food poisoning and HOW TO PREVENT THEM, then they are putting themselves, your customers and your company at risk! At MAS Environmental we offer companies and individuals everything they need to prevent Food Poisoning and ensure the highest levels of food safety. Starting at training for all levels of staff (including In-House training), production of reading material & signs for use in the workplace, kitchen inspections, guidance and advice for workplace improvement and solutions. We have produced our own complete booklet for Food Safety and Health & Safety called the Golden Rules of Safety. 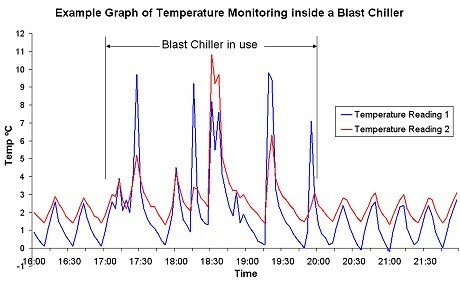 Below is an example of a graph showing the temperature readings from inside a Blast Chiller. We create these graphs to help us in our inspections. Temperature readings are vital for equipment which stores food at high or low temperatures as incorrect storage causes a high number of food poisoning incidents. Our service then continues into large scale projects such as re-designing kitchens for improved hygiene standards. See Kitchen Design for information. We offer training for all different levels of experience and courses which can be of benefit to any person who deals with food. Details of all the courses can be found in Food Safety Training.